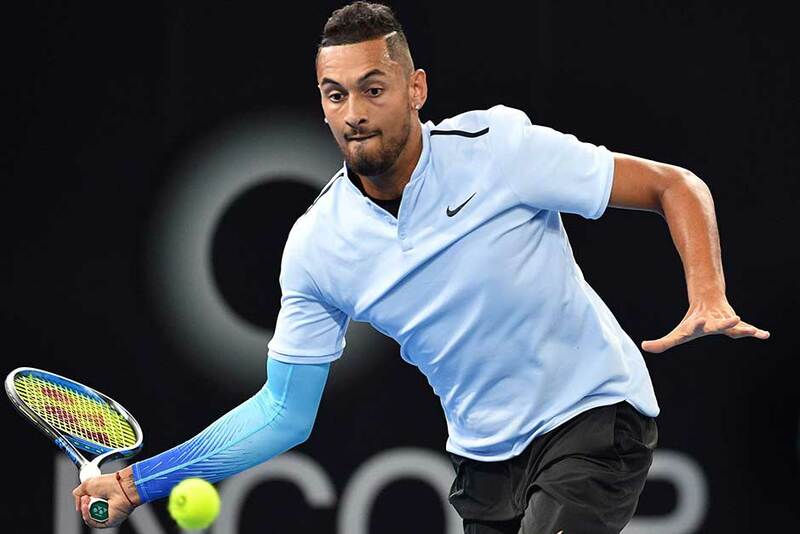 Brisbane: Australian third seed Nick Kyrgios overcame a leg injury to reach the quarter-finals of the Brisbane International on Wednesday as fourth seed Milos Raonic was bundled out by wildcard Alex De Minaur. Kyrgios came back from losing the first set to fellow Australian Matthew Ebden to win 6-7 (3/7), 7-6 (7/5), 6-2, finishing the match with his leg heavily strapped. In the late match on Pat Rafter Arena, 18-year-old De Minaur had the biggest win of his career when he stunned former champion Raonic 6-4, 6-4. Raonic has not played since October because of calf and wrist problems and he looked rusty against De Minaur, making a host of unforced errors. De Minaur was also able to handle the Canadian’s huge serve, breaking him once in the first set then twice in the second to open a 5-2 lead. Raonic managed to get one back as De Minaur faltered while serving for the match for the first time. But he held his nerve on his second attempt and closed out the victory to set up a surprise quarter-final against American qualifier Michael Mmoh. Mmoh upset Germany’s eighth seed Mischa Zverev 6-2, 5-7, 6-4. Earlier, Kyrgios took to the court with tape on the back of his left knee. After losing the first set in a tiebreaker, the third seed had his leg heavily strapped and came back to win the next two, allaying any fears he might join the long injury list at the top of men’s tennis. “A couple of days out [from the tournament] I was playing some points with Lleyton [Hewitt] and then I kind of felt my knee a bit,” he said. Kyrgios said he had some fluid on the back of his left knee but it was not a cause for concern. “It doesn’t really hurt me when I move,” he said, “just when I’m kind of straightening my leg. Ukraine’s Elina Svitolina continued her impressive start to the season when she demolished Croatian Ana Konjuh 6-3, 6-1 in the second round in Brisbane on Wednesday. Svitolina took just 64 minutes to see off Konjuh at the Pat Rafter Arena and book an enticing quarter-final showdown with Britain’s Johanna Konta. The 23-year-old Svitolina started the week as world number six but would finish it as number four if she wins the tournament. She won five tournaments in 2017 and goes into the Australian Open as a serious contender for the year’s first Grand Slam. Meanwhile, Caroline Wozniacki continued to build on her WTA Finals victory late last year with another impressive performance on her way to a 6-2 6-2 victory over Croatia’s Petra Martic to reach the quarter-finals of the Auckland Classic. The Danish world number three ended 2017 with the biggest title of her career in Singapore and returned a day after thrashing Madison Brengle in her season opener to hit 21 winners against eight unforced errors in the 53-minute win over Martic.